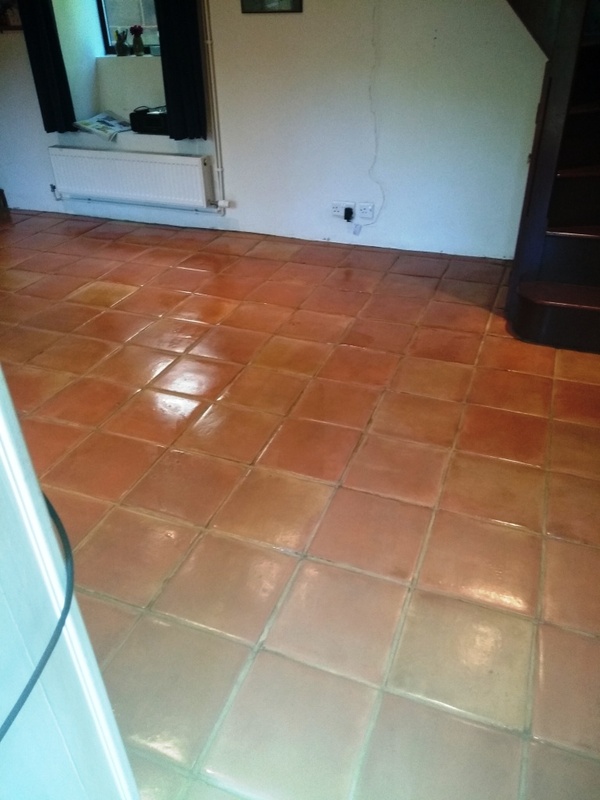 The photographs below are of Terracotta tiled floor at a house in the coastal town of Poole, Dorset that had not been professionally clean in some time and having seen years of wear and tear from the active family who live there was not looking its best. 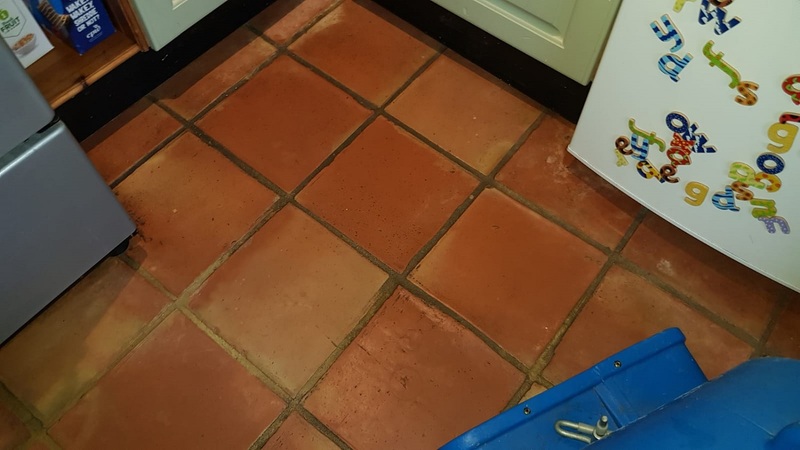 The Terracotta had previously been treated with Wax which had now pretty much been worn off and the grout had gone dark with the dirt. We often find wax being used traditionally as a coating on Terracotta however a lot of science has gone into developing sealers in the last twenty years that do a much better job so Wax is not something we could recommend these days. After surveying the floor and running several tests I was happy what was left of the wax could be removed and provided the customer with a quote for stripping the floor and resealing. The quote was accepted, and we arranged a date to return and carry out the work. The floor was covered in a strong dilution of Tile Doctor Pro-Clean and this was left to dwell on the floor to allow it to soak into the tile and get to work on the dirt and breakdown the dirt and what was left of the wax. 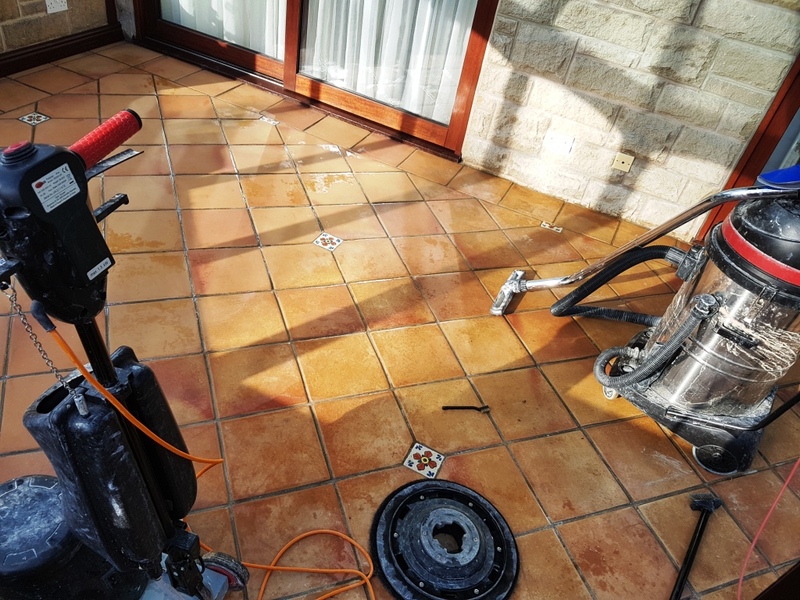 The solution was then worked into the tile and grout using a heavy 17″ rotary scrubbing machine fitted with a black scrubbing pad and then rinsed off using a high-pressure tool that also extracts the soil at the same time. The grout was cleaned using more Pro-Clean and a stiff brush that was run along the grout lines. After rinsing and extracting again the floor was inspected to look for any outstanding issues. 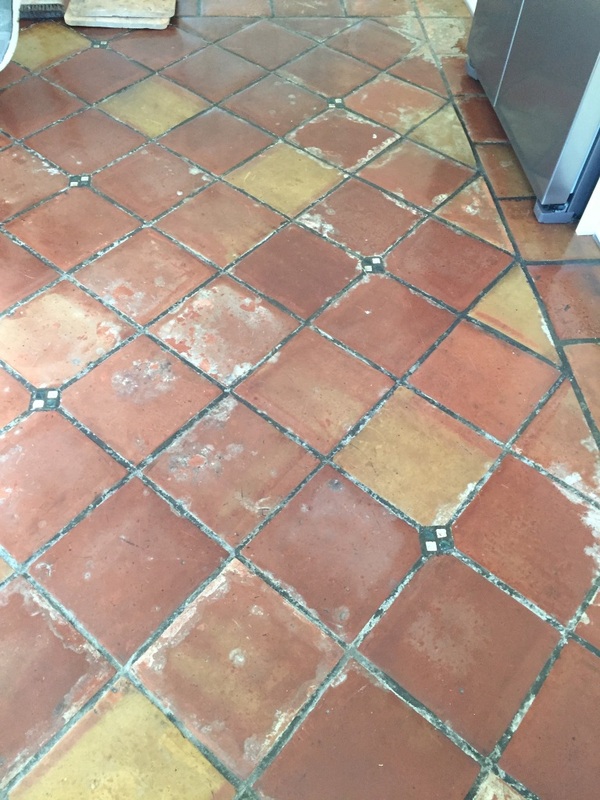 This highlighted several areas where Wax residue was still present on the tile which were spot treated using a new tile product called Tiled Doctor Wax Away which as its name suggests is designed for the purpose. After another rinse and extraction, the floor was inspected again and this time happy with the floor it was left to dry off fully overnight with the assistance of an air mover. Returning the next day, the floor was checked first with a damp meter to ensure it was dry and ready for sealing. 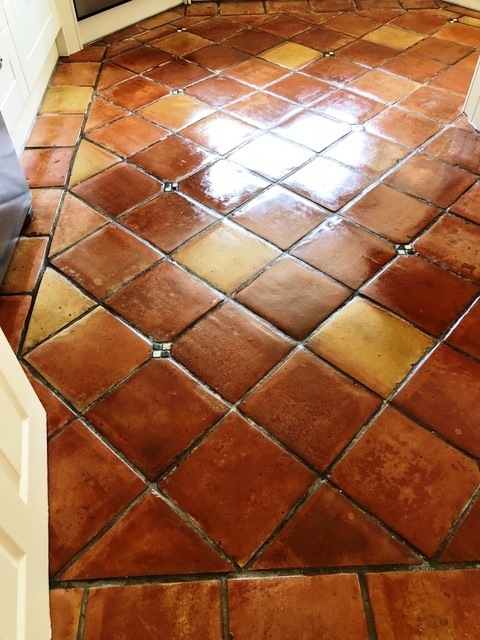 The moisture readings were all good, so I set about sealing the Terracotta using three coats of Tile Doctor Seal and Go which is a water-based sealer that adds a robust and deep finish to the tiles. This can take some time to apply as you have to wait thirty minutes to allow the first coat to dry before applying the next. I’m not sure the photographs do it justice, but the homeowners were “over the moon” with the difference in the floor and regretted leaving it so long before calling us in. 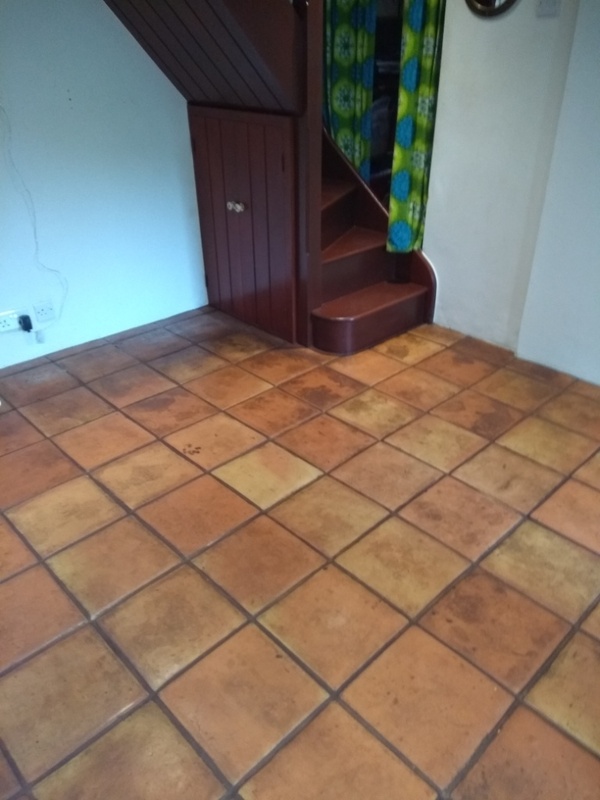 We were called by a customer with a Mexican Terracotta floor who was looking at having it taken it up and replaced but before doing wondered what it would cost to have it renovated. I visited the property in the nearby market town of Stroud in the centre of Gloucestershire to survey the floor and advise on options. Stroud by the way is a lovely part of the county and sits within the Cotswolds which is an area of outstanding beauty. The customer had this floor laid thought the ground floor just five years earlier and had been was advised to seal it with wax. After three months the wax had broken down and started collecting dirt as you can see from the pictures. Unfortunately, he had not been advised the correct way to look after his floor and was now fed up with its appearance. Help was at hand and I was confident I could restore the floor for a lot less than replacing it, I explained what could be done, agreed a price which was accepted and agreed a date for carrying out the work. 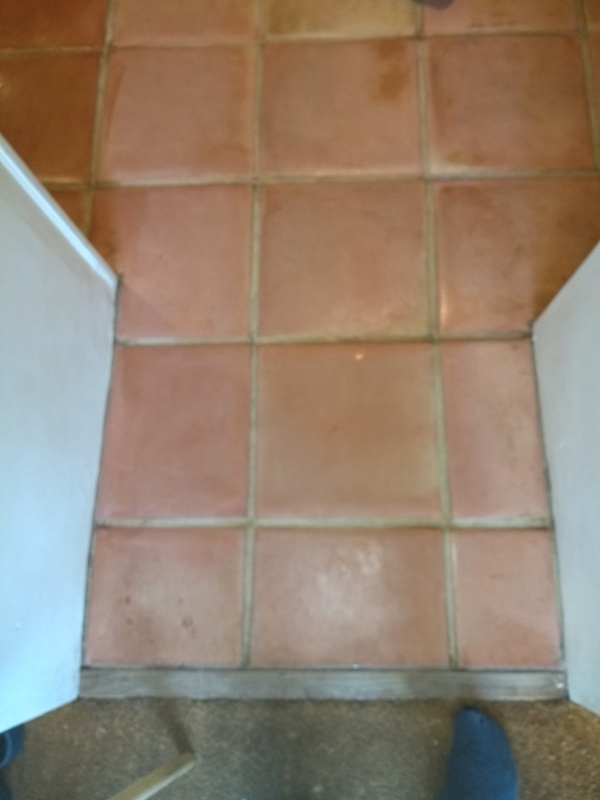 So, the first job was to strip the layers of wax and sealant off using Tile Doctor Pro-Clean and Remove and Go. 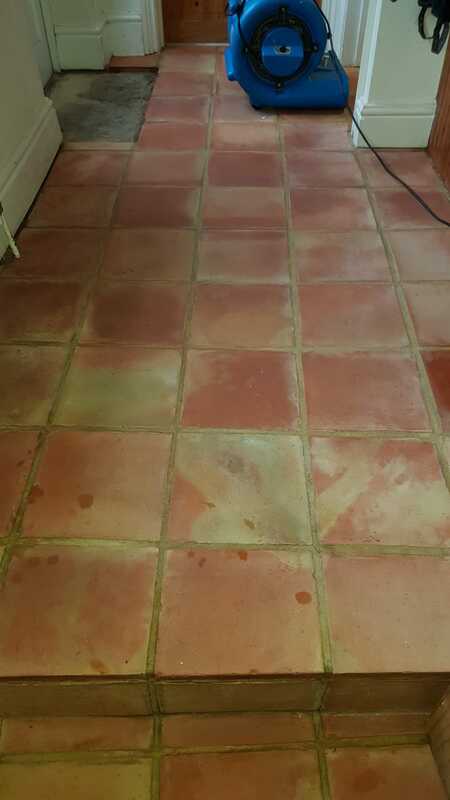 I combined the products together to make a very effective cleaner and coatings remover and left them to soak into the Terracotta tiles for ten minutes, before scrubbing them in with a black pad fitted to a rotary floor machine. This process released a lot of dirt and waxes from the floor which I extracted with a wet vacuum and then retreated areas that needed more work until I was happy it was as clean as it could be. After the floor was clean I set about on grout lines these were also in a bad state, they needed a lot of manual scrubbing with Pro-Clean which was worked in with a narrow stiff brush to get them clean. Afterwards, happy with the result, I rinsed the floor three times with water to remove any trace of the cleaning products and soil from the floor. Because I had to use so much water and cleaning products to achieve a good result I left the floor for nearly a week, so it could thoroughly dry out. Mexican terracotta is very porous, and it would need to be dry before sealing so I figured five days should be enough time. I returned after five days and checked that moisture levels of the floor were satisfactory with my moisture meter. Once I was satisfied I was good to go ahead with the sealing. I decided to use two different types of sealant on this job. For the first coat I used Tile Doctor Colour Grow which is an impregnator that soaks into the pores of the clay tile protecting it from with and enhancing the natural colours in the process. I then applied six coats of Tile Doctor Seal and Go letting it dry in between coats. Seal and Go is a water-based blend of acrylic polymers that provides both a stain resistant seal and a durable low-sheen finish, which the customer had requested on this job. The customer was pleased with the result, he never expected it to look so good and had thought he was going to have to put a new floor down. Not only had we completed a great job for them, they had been saved significant expense too. 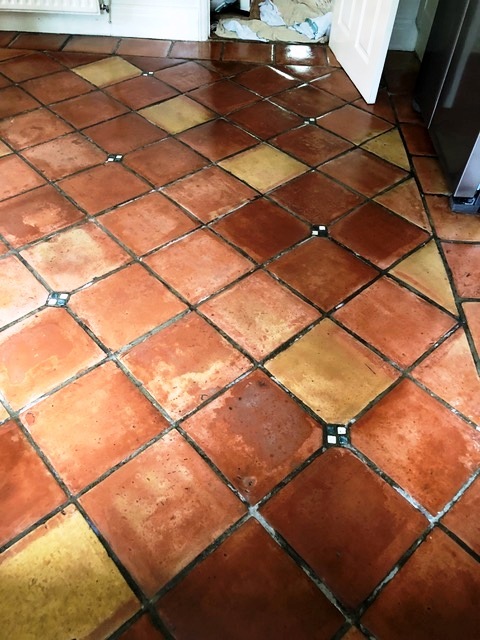 My client from Penwortham, on the outskirts of Preston on the south bank of the River Ribble contacted me about their Mexican Terracotta kitchen floor as you can see from the photographs below was in a bit of a state. On the pictures you will see numerous white marks which have happened due to the use of bleach-based supermarket cleaning products on the tiles. The bleach has upset the original wax polish and over time layer after layer of new polish has been applied to try and hide it, but they had also continued to use the wrong cleaner, so the problem simply became worse. 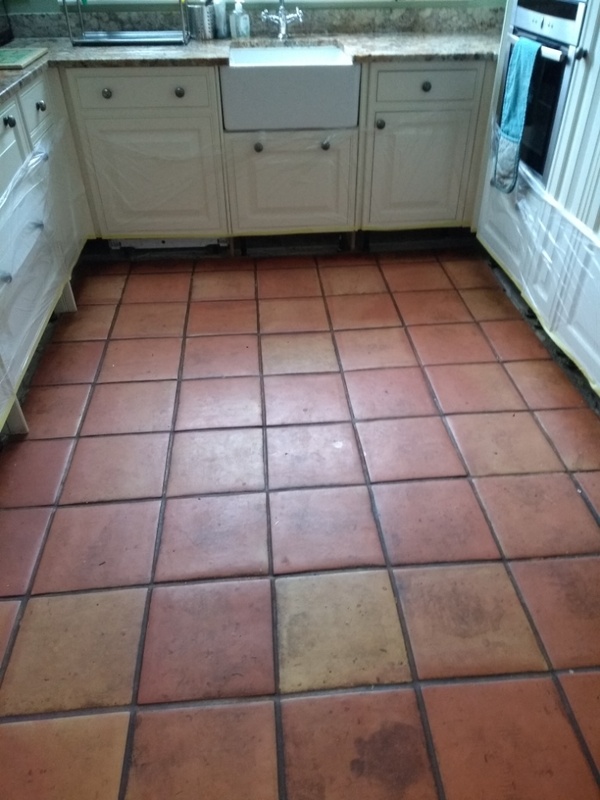 The floor was otherwise in good condition with very little damage, although the grout had also discoloured and needed deep cleaning. 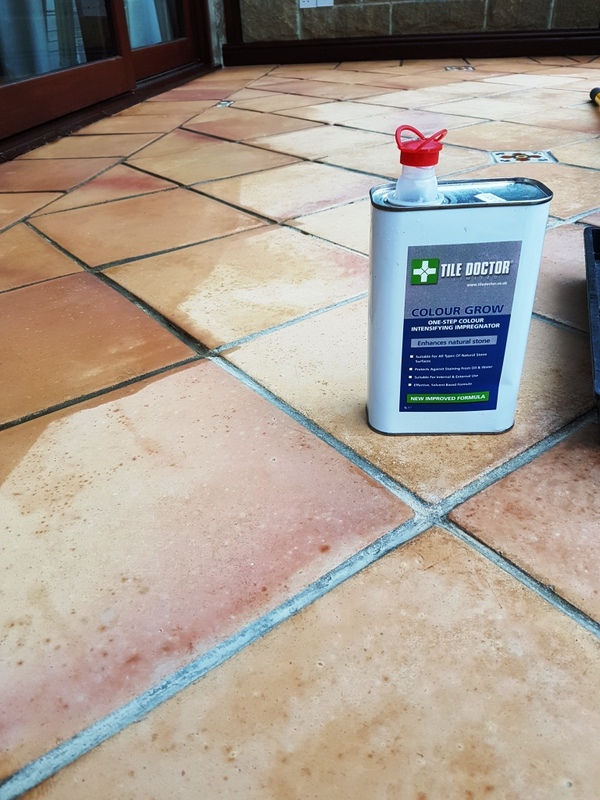 Luckily Tile Doctor have recently brought out a new product called Tile Doctor Wax Away which is specifically formulated to remove layers and layers of compacted wax polish. It was the first time we had used it on a situation this bad before to it was in for a good test. I’m please to say Wax Away didn’t disappoint and is designed to melts the formula that makes the wax stick together. So, with the aid of a stiff deck brush the product was scrubbed into the floor and then extracted off the floor with an industrial wet vacuum. With the old layers of wax removed the white markings that were spoiling the look of the surface disappeared. Stubborn areas had to be retreated but once all the wax slurry was removed using the wet vacuum you could see the improvement in the floor. The grout was then cleaned using a Tile Doctor Pro-Clean scrubbed into the grout line using a stiff brush, one done the soiled cleaning solution was rinsed off the floor with water and extracted using the wet vacuum. The only thing we couldn’t fix was the damage done to the grout by the bleaching agent which hydrates grout and turns it white. It often cracks the grout as well with long term usage as in this case. We did offer to apply a grout colourant over this once the sealer had fully dried, but this was an added cost the client didn’t want to bare which was understandable. This is a service we could return in the future to complete if the client wished. Once cleaned, we fully rinsed with water to remove any chemicals and left the kitchen floor to dry out overnight. Returning the following morning to seal the floor. Before starting the sealing process however I wanted to be sure the floor was indeed dry, so I ran a few checked with a moisture meter in different spots. Once satisfied we moved on to the sealing process. Terracotta tiles being made of clay are very porous and so seven coats of sealer were applied before it was fully sealed. 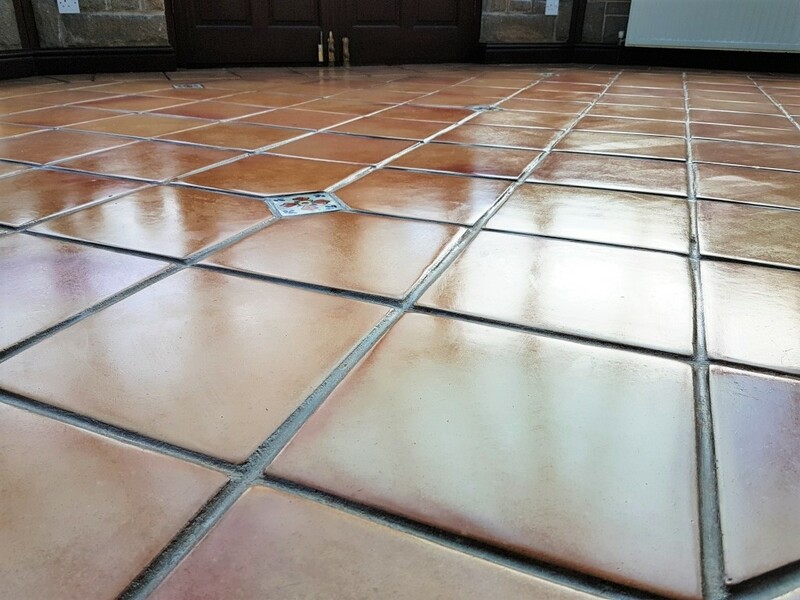 We used Tile Doctor Seal and Go for this, it’s an excellent choice for Terracotta as it brings out the true hue and texture of the clay as well as adding a nice subtle shine. The new sealer will make the floor much easier to maintain than the old wax polish they had previously been using. 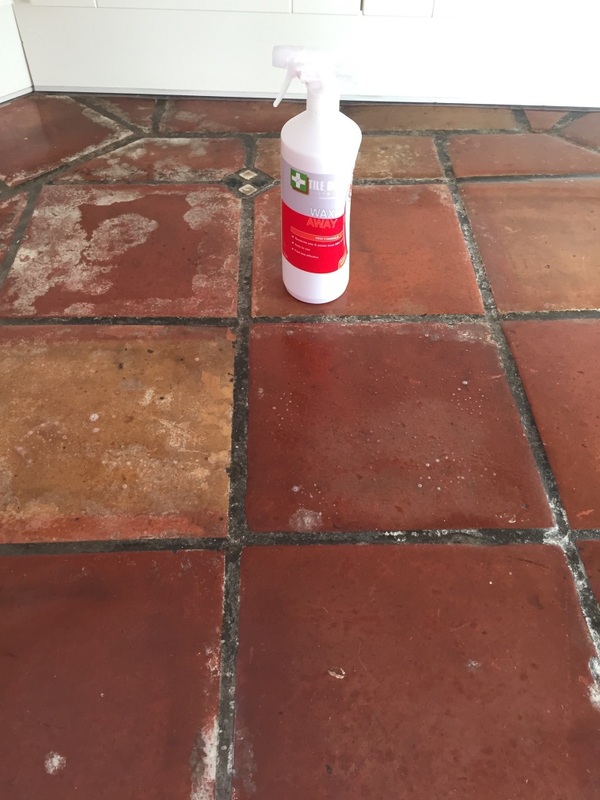 For regular cleaning of sealed floors, we recommend using Tile Doctor Ph Neutral Tile Cleaner. Most supermarket cleaning products are acidic which will prematurely degrade the sealer over time. As you can see from the after photos the floor was left looking much cleaner and brighter and the horrible white marks were no where to be seen. The client was very happy with the final result. Terracotta Tiles have been around in certain parts of the world for over two millennia; in fact, the word Terracotta means burned earth. The ancient Romans used a variety of Terracotta tiles in their villas and palaces for many centuries. Terracotta tiles are thicker than most modern tiles, giving them strength and durability. The one big downside to Terracotta, however, is that it has no glaze on the surface and can pick up and store muck and dirt very quickly. If you have ever owned a Terracotta floor before you will be able to relate to this problem. Such was the dilemma facing our client in rural Hope Valley in the Peak District National Park of Derbyshire. 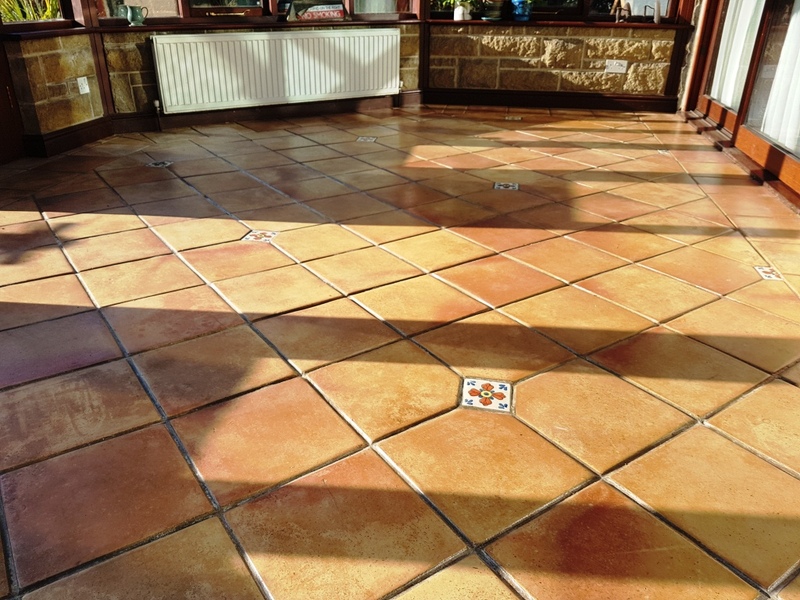 Her Conservatory had been laid with Terracotta tiles around 25 years ago and over the years had been continuously covered with wax. Now, no matter how many times she mopped the floor it never looked clean because all the dirt over many years had been drawn in and sealed into the wax. She called in Tile Doctor to deep clean the floor and treat it with a gloss finish. I started by removing the layers of wax with Tile Doctor Nano-Tech HBU (a heavy build-up remover that is designed to work where other cleaners won’t) and Tile Doctor Remove and Go, specially formulated to draw out ingrained stains and remove heavy grease build-up. I combined both products into a powerful cleaning cocktail and left them to soak into the floor for about twenty minutes. The solution was then scrubbed into the tile and grout using a black scrubbing pad fitted to a rotary machine. The resultant soil was rinsed off with water and then extracted from the floor using a wet vacuum. 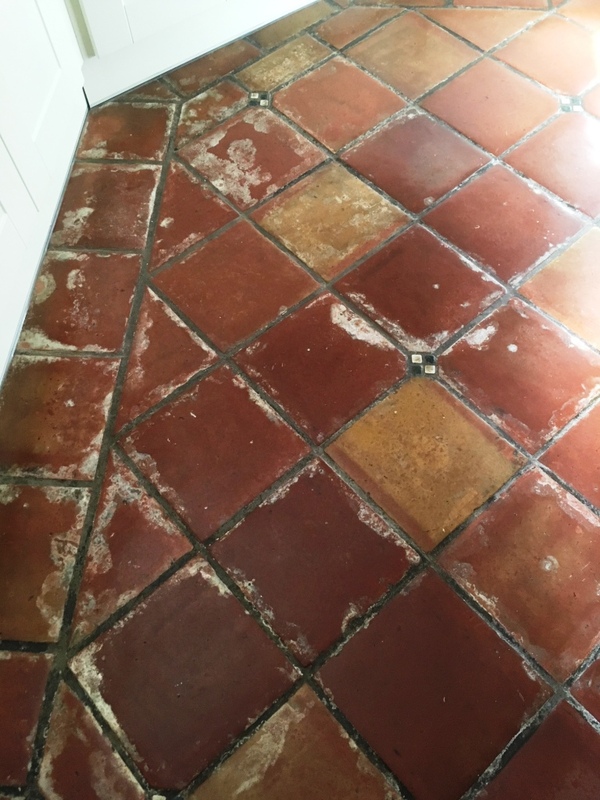 After cleaning I inspected the floor and could see there was still some wax left in the grout between the Terracotta tiles, so I went over the floor with a hand-held steamer and scrub brush, it took some time, but the process was perfect to remove the last traces of wax. Finally, I washed the floor with clean water twice and left it to thoroughly dry overnight. The following day I went back to seal the floor but found there were still a few areas with higher levels of damp than I would have liked. My solution was to seal the tiles with Tile Doctor Colour Grow. This is a superb colour intensifying matt sealer that provides durable protection and enhance colour but importantly, it’s fully breathable therefore allowing any damp in the tiles to evaporate. I then left the floor to completely dry out, which took five days. On my return I finished the sealing of the floor with four coats of Tile Doctor Seal and Go. This is a specially formulated water-based blend of acrylic polymers that provides a stain-resistant surface seal and a durable low-sheen finish that works really well on Terracotta. 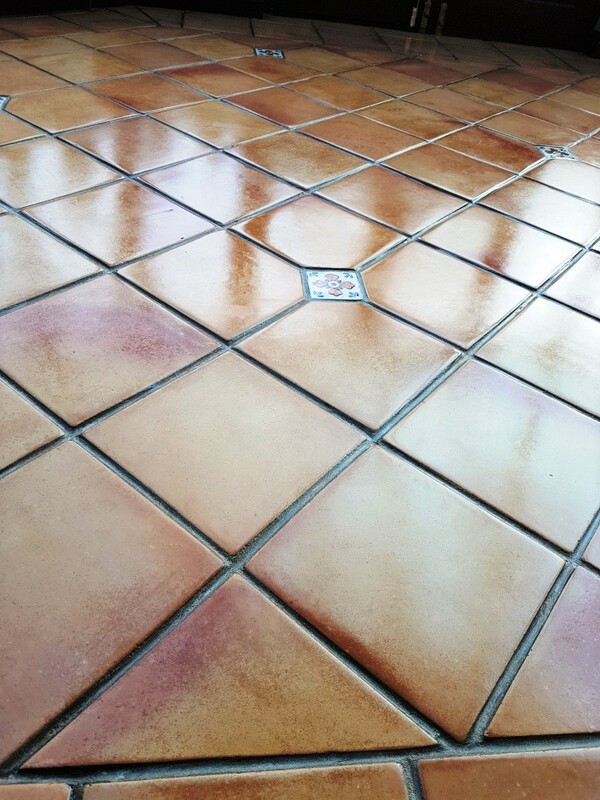 The conservatory looked beautiful with its clean Terracotta tiles. The unsightly and grimy orange-brown floor had been restored to its original Terracotta colour with a very attractive sheen. And, of course, the floor was now correctly sealed to prevent the problem happening again and to make mopping easy. I left the house with good feeling!